Happy Saturday everyone! I used Taylor's TECC60 sketch to make another cuppie Easter card! Most of my supplies came from the Easter Key Ingredients, available at Taylored Expressions. The coordinating items make creating a breeze! I stamped and colored my cuppie rabbit image with Copic markers. I also paper pieced the lower portion of the cupcake. Finally, I added a Swarovski crystal (which I colored with a Copic marker) to the cherry. The 2 panels (oval and smaller rectangle) and sentiment are popped up with foam tape for added dimension. Have a great weekend and thank you for visiting! Accessories: Oval Nestabilities (Spellbinders), Cuttlebug (Provo Craft), Markers (Copic), scalloped sentiment border punch (Fiskars), scalloped scallop border punch (EK Success), word window punch (SU! ), pink brads (Taylored Expressions), brown brads (Bazzill), crystal (Swarovski), foam tape, thread, sewing machine. This is adoarble! Love this Easter card! OH -- I LOVE LOVE LOVE the pink/brown combination -- so pretty!! Taylor's Cupcake/Bunny stamps are so cute!!! Your card is so GREAT! Oh this is so cute, Stephanie! The coloring on your bunny cupcake is fabulous! 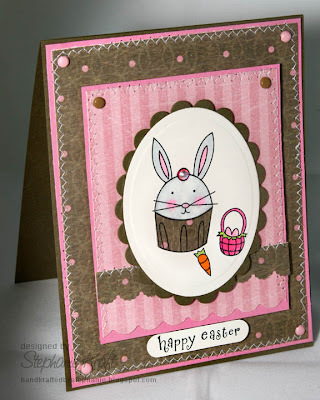 Stinking cute bunny with fun stiching! Love what you did with the te sketch!